Well… it's official. Most gas stations are above $4 in Baltimore City and Baltimore County. I passed several which were way above the $4 mark. One Exxon I saw was $4.17 for regular gas! The gas station (and repair shop) where I work went up 14 cents today! 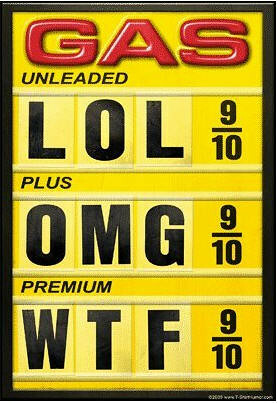 From $3.95 to $4.09 per gallon for regular gas payed with a credit card. You save 4 cents paying with cash, but with these prices it makes you feel the pain no matter how you pay. It's completely crazy! I saw 1 station that was still at $3.95 for regular. With most of the other gas stations above the $4 mark they will most likely be going up tomorrow, or have already gone up as of tonight. It's ridiculous because there probably is no real reason for the prices to be going up so quickly and going so high. I guess I need to start grouping my errands and choose where I'm driving carefully. Posted on Author adamCategories SummerTags $4, $4 gas, baltimore, baltimore gas prices, carroll fuel, exxon, fuel, gas, gas prices, gas stations, lol, maryland, maryland gas prices, omg, pump, wtf1 Comment on Gas over $4! Buy a Portable Air Compressor! Portable Air Compressors are definitely worth $10-$30. Many Gas Stations will charge for using Air Pumps. If you are like most people, I assume you don't carry quarters. (Definitely not enough to pump up your tires!) I also assume you hardly check how much Air is in your tires too. I'm I right? Yeah, most likely! It's just to inconvenient to worry about! A Portable Air Compressor you keep in your trunk will not only save you the hassle, but time and money as well. Your tires will last a lot longer if you keep them properly inflated to the correct pressure. The Fuel Efficiency of your car will also be much better with properly inflated Tires. If you aren't sure about the correct pressure, check inside the door or around the opening. Don't follow what it says on the sidewall of your tires! You can find Portable Air Compressors in big-box stores or a local Autoparts Stores. Buy a Portable Air Compressor! Trust me, you won't regret it! Pictured below is my Portable Air Compressor. I bought it at Target for $20, and it's served my family and I well. I've used it on all of the cars we have, including many people's cars who needed some Air when they've stopped by. I'll always have one handy! Posted on Author adamCategories TiresTags fuel efficiency, handy, inflated, portable air compressor, proper, psi, pump, temperature, TiresLeave a comment on Buy a Portable Air Compressor!